Lynette Wallworth’s Virtual Reality work Awavena to premiere at Carriageworks following screening at Venice International Film Festival. Awavena, the remarkable new Virtual Reality (VR) work by Emmy and AACTA award-winning artist and director Lynette Wallworth, which screened to international acclaim at the recent Venice International Film Festival, will have its Australian premiere at Carriageworks at Create NSW’s 360 Vision VR and AR Industry Event on 16 November 2018. A free public exhibition of the work will follow from 17 November until 9 December 2018. The second in a series of VR works by Lynette Wallworth and producer Nicole Newnham, Awavena is a stunning tale of metamorphosis, made at the invitation of the Brazilian Amazonian Yawanawa people. The work tells the story of Hushahu, the first woman shaman of the Yawanawa, and of the radical reconfiguring of gender relations that took place following her induction into the Yawanawa spiritual traditions by Tata, the tribe’s 100-year-old shaman who came to believe that the future strength of the Yawanawa people relied on power being shared with women. 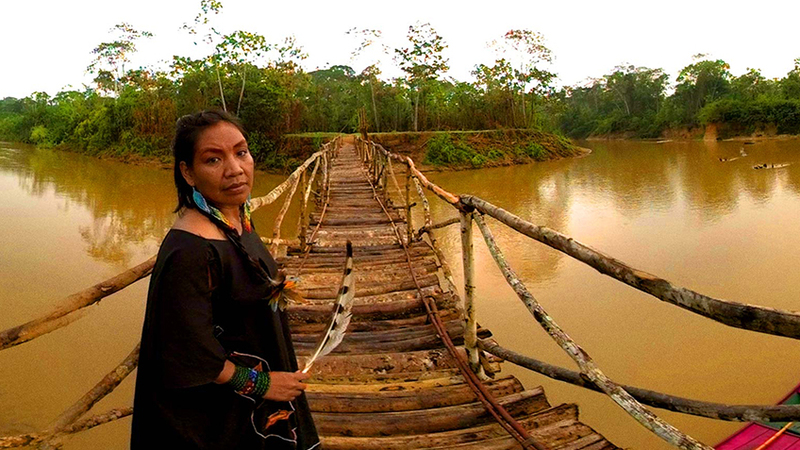 Wallworth is recognised as an international leader in new and emerging technologies and was invited to the Amazon by Tashka Yawanawa, chief of the Yawanawa people, after he saw her previous VR film Collisions and recognised a compatibility with Wallworth herself, VR and the visioning techniques that sit at the heart of Yawanawa society. Awavena first premiered at the 2018 Sundance Film Festival and screened at the World Economic Forum in Davos. For the Venice International Film Festival, Wallworth developed a walk-through extension to the work called The Blessing Space, which will be included at Carriageworks. Awavena is a mixed reality work that uses the Vive Pro headset to create transitions from augmented to virtual reality and head tracking in the headset to respond to the viewer’s gaze. The Blessing Space uses a HP backpack computer for a free-roam experience of the Yawanawa forest in vision state where voice and breath are used to activate point cloud particles generated using a portable LIDAR scan of the forest. Fluorescent imagery in Awavena was filmed in stereo from specimens found in the forest by Wallworth’s long-time scientific collaborator Dr Anya Salih. A unique scent for the Awavena experience has been created by Barnabé Fillion courtesy of Aesop. Awavena will be presented at Carriageworks from November 17 – December 9, 2018. Visitors should arrange their visit in advance through Eventbrite to arrange an allocated time ticket.